Allentown, Pa. - In today's Wall Street Journal, U.S. 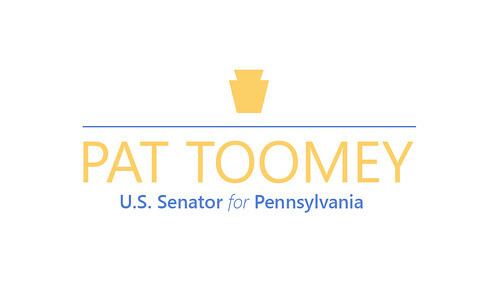 Senator Pat Toomey (R-Pa.) writes that President Trump should work with congressional Republicans to fix the flaws of, then approve, the United States-Mexico-Canada Agreement (USMCA) in this session of Congress, or face a possible quagmire getting his trade agreement passed when Democrats take control of the House of Representatives in the new year. Senator Toomey also outlines the improvements to the current USMCA that need to be addressed in the agreement's implementing legislation in order for him to support its ratification. Yesterday, Senator Toomey and eleven of his Senate colleagues sent a letter to President Trump urging him to take the necessary procedural steps to ratify the USMCA this Congress. For free traders like me, the recently negotiated United States-Mexico-Canada Agreement, or USMCA, is a mixed bag of trade-enhancing and trade-restricting changes to the current North American Free Trade Agreement. My support for the new deal in the coming weeks, and perhaps that of many of my Republican colleagues, will depend on the steps the president takes to strengthen it. On the positive side, the USMCA enhances the current Nafta with a new section covering digital trade, broader intellectual property-rights protections, and a ban on localized data storage requirements. The benefits of these improvements are unfortunately more than offset by the USMCA's trade-limiting provisions. These include its expiration 16 years after it enters into force, continued use of Section 232 tariffs, severely limited investor dispute settlement protections, arbitrary wage requirements on auto and auto parts production, and numerous quotas on autos, steel, and aluminum, among other things. To ratify the USMCA, President Trump faces a choice: make further trade-restricting concessions and hope they secure passage in a House of Representatives controlled by Democrats next year, or make protrade modifications in the implementing legislation and enact the USMCA under a Republican-controlled Congress before the end of this year. I urge him to choose the latter. Entrusting House Democrats with passing the USMCA is a dicey proposition, at best. Many of the newly elected Democrats ran on opposition to all things Trump, and the next House speaker will not prioritize passage of President Trump's signature trade achievement. In addition, liberal constituencies are already panning USMCA. Environmental organizations are actively opposed. Labor unions are withholding support despite significant courtship from the U.S. Trade Representative. And key House Democrats are demanding changes that would undermine trade among the three countries-and may even require reopening negotiations. The new Democratic majority in the House also might indefinitely stall passage of USMCA, goading the president into responding with the "nuclear option"-a unilateral withdrawal from the existing Nafta. This would be disastrous for the American economy, and would kick off a constitutional battle between the branches over trade power. To avoid this quagmire, President Trump should work with congressional Republicans to incorporate additional free-trade features in the USMCA's implementing legislation so that it can be passed before the next Congress is sworn in on Jan. 3, 2019. These improvements wouldn't require reopening negotiations with Mexico and Canada. To preserve this option, the president, under Trade Promotion Authority rules, must submit the final text of the trade agreement to Congress before the end of this month. By doing this, the president would preserve the fast-track procedures of TPA, including a straight-up, simple majority vote requirement in the Senate. This procedural step does not commit President Trump to a strict timeline for passage of the USMCA. Rather it leaves open the option for congressional consideration this year or next. Considering the USMCA before the end of this year would require a process more expedited than some of my colleagues would prefer. However, it may be the president's best shot at securing a vote on USMCA, and preserving the North American trading relationship. That is why I, and 11 of my Republican colleagues, sent a letter to President Trump late Tuesday, asking him to keep open the option of passing this agreement in this Congress. If President Trump chooses to pursue a USMCA vote in Congress this year, I will engage in a good-faith effort to work with his administration on implementing legislation that corrects the flaws listed above and that could pass Congress with the votes of free traders like me.